We rushed to the airport to try make our 1time flight on time. We try and leave sufficient time as we don't enjoy the drama of running late, but somehow it hadn't worked out this time. We dropped our vehicle off at First Car Rental Johannesburg, and just left the key in the ignition! We got to the lifts, and Murphy's law - the lift we got into wouldn't work. It's amazing how the small things become big things when you're running late. We got into the next lift, and it was closing when suddenly somebody changed their minds about taking the stairs and jammed his way into the lift as it was closing...lift opened again...more time wasted, would we make it in time for our flight? We rushed through O.R. Tambo International Airport, happily there was no queue at 1time's check-in - God bless them! The check-in assistant made a phone call which got us sitting together in pairs. Once we'd checked in, I breathed a sigh of relief, and promised myself to double up my efforts next time to avoid the drama. As we boarded, a kind lady offered to swap her seat and we all sat together - one happy family together again :) We were delighted as usual when 1time gave our daughter a free kiddies pack - please keep it up, this is a key differentiator. I got a window seat, and here's some photos I took during the flight. I had to photoshop a few of them to make them clearer. The straight line near the bottom left is the R355 between Ceres and Calvinia, and below the wing is the Ongeluks River (Misfortune River), which is said to have received its name from a Boer being torn to pieces by a lion. Here's an extract about it (from Travels in the Interior of Southern Africa): "The river was quite dry, excepting 2 or 3 puddles of bad water. We took up our station in the bed of it, where an abundance of Karoo thorns & large Karree trees afforded us shelter from a violent south-easterly wind. We had scarcely released the oxen from the yoke, when we were visited by a Boer, lying here with his flocks. We accompanied him to a miserable hut close by, to purchase some sheep. His only food was mutton, without bread, or any kind of vegetables. His sheep were numerous & thriving, though they fed on nothing but bushes: of large cattle, he had none, as the land of the Karoo & the Roggeveld does not produce the grassy pasture proper for cows & oxen. Our visitor's place in the scale of civilisation, would be nearly at the bottom, if even it should not be below zero: his mental powers appeared to have lowered themselves down to a level with those cattle which were the only concern of his thoughts. He seemed to possess a mere animal existence. He could eat meat, drink a dram, smoke a pipe, spit, and practise some other disgusting vulgarities; which last enjoyments he indulged in without ceremony, and almost without cessation. He seldom spoke, because he had nothing to say; while a lifeless eye betrayed the vacancy of his mind." Under the wing is the R303 between Prince Alfred Hamlet & Citrusdal, just north of the Gydo Pass. To the left of the picture we can see the Witzenberg Valley. Here we can see the Voelvlei Dam, near Gouda. From 1734 to 1948 the dam was situated on a farm belonging to the Walters family, of German descent. In 1948 the government of Jan Smuts expropriated the land, without consent ever being obtained from the Walters family, who were given 6 months to leave the farm. At the bottom-left of the photo are the Elandskloofberge. Fisantekraal Airport (FAFK) with Fisantekraal on the left middle of the photo, and between them is the Dirt & Dust 4-wheel drive track. The north-south road to the right of the airport is the R304 to Malmesbury. Brackenfell South, to the left of the dams is Groenvlei Guest Farm, and at the bottom left is the Bottelary Road to Stellenbosch. The whitish bits in the middle are Cape Gate Shopping Centre. Till death do us part - to the left of the photo is Zevenwacht & Langverwacht Lodge, scene of many a wedding. At the top-left is Kuilsriver. In the middle is Kaapzicht Wine Estate. Blackheath & Blue Downs, with the R102 Van Riebeeck Street running parallel to the wing of the 1time aircraft. Near the tip of the wing is the Happy Valley settlement. Near the bottom is Kleinvlei. What's up with the 1time share price? In a survey on our Facebook page, most people indicated they would prefer lower base prices and the airline to charge for luggage. Kulula have recently implemented a new baggage policy, and 1time (as well as other airlines) are falling behind the curve. Kulula's credit card and the supply of Kulula Moolah we get from it, mean we love flying Kulula for low prices - 1time would do well to consider doing something similar. 1time is also behind its competitors in terms of its affiliate marketing strategy. 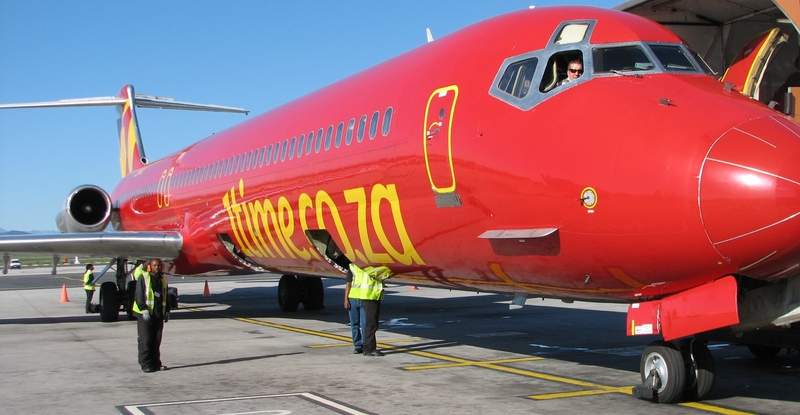 A 1time flight special called "fly more pay less" was running on the 24th Aug 2011, so we took advantage of it and booked Johannesburg to Cape Town flight tickets with them. For 2 adults, 1 child and an infant it came to a total of R1387 (taxes, levies and VAT came to R562.45 of the total!). Anyway, we fly on the 5th of December, and look forward to reviewing this flight for you! Check in opens 2 hours before scheduled departure time, and closes 30 minutes before departure time. Passengers are advised to arrive for check in 90 minutes prior to departure time. Checked baggage is limited to 20 kg's per passenger, and 1 small piece of hand baggage limited to 5 kg's. Dangerous articles, including flammable goods, poisons, gas cylinders, corrosives, infectious substances, firearms and explosives, should not be carried in your checked items. Children under the age of 12 years must be accompanied by an adult aged 18 years or over. Reservation changes may be made up to 2 hours before departure of the booked flight. Changes may be made on our website, through our call centre, or at any of our airport offices. A 120 Change of Reservation fee, plus the difference in fare if applicable, will be charged per passenger, If the fare on the new flight is lower than the original fare, no refund will be issued. The above is also applicable to name changes. If a flight is cancelled by 1time. If 1time is unable to honour the passengers reservation resulting in the passenger being denied boarding. Passengers requiring assistance must arrange this in advance through our call centre. Lost or delayed baggage must be reported immediately on arrival. Passengers will be compensated for lost baggage to a maximum of USD 20 per kg of checked-in baggage. 1time will not accept liability for losses or damages to valuable items such as, but not limited to, cell phones, jewelry, laptops, electronic items, cash, credit cards, documents, sunglasses, spectacles, fragile or perishable items packed in baggage. Baggage is designed to protect it's contents. 1time will not accept liability for scratches, cosmetic or minor damage to baggage, nor for any items protruding from bags, such as handles or trolleys.